Mysore District is an administrative district located in the southern part of the state of Karnataka, India. 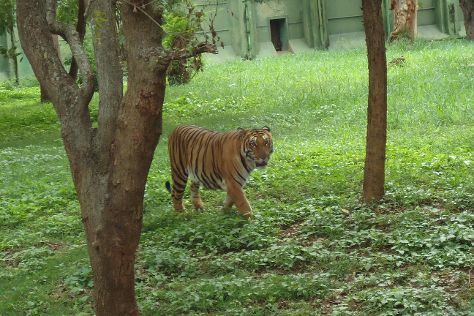 Get ready for a full day of sightseeing on the next day: learn about wildlife with up-close encounters at Sri Chamarajendra Zoological Gardens, then take in the spiritual surroundings of Jama Masjid, and then admire the local landmark of Brindavan Garden. For other places to visit, reviews, traveler tips, and tourist information, read our Mysore District tour itinerary site . Pune to Mysore District is an approximately 8.5-hour combination of flight, bus, and train. You can also do a combination of flight, bus, and taxi; or drive. In April in Mysore District, expect temperatures between 36°C during the day and 26°C at night. Wrap up your sightseeing on the 27th (Sat) to allow time to drive to Ooty (Udhagamandalam). On the 28th (Sun), take your sightseeing to a higher altitude at Doddabetta Peak, take in nature's colorful creations at Botanical Gardens, and then contemplate the waterfront views at Ooty Lake. Planning Ooty (Udhagamandalam) trip won't be overwheling when you use's Insprock itinerary maker. Drive from Mysore District to Ooty (Udhagamandalam) in 2 hours. Alternatively, you can do a combination of taxi and bus; or do a combination of taxi and bus. In April, daily temperatures in Ooty (Udhagamandalam) can reach 36°C, while at night they dip to 26°C. Cap off your sightseeing on the 28th (Sun) early enough to travel back home.